Town boss Billy Heath admits his side didn’t reach the same level they showed against Morecambe after Halifax’s 2-2 draw at Matlock on Tuesday night. The Shaymen thrashed Morecambe 6-2 on Saturday but were held to a draw at Matlock, which maintained their unbeaten record in pre-season. 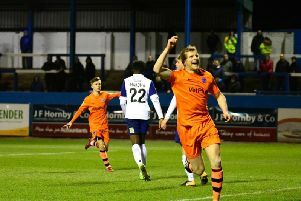 “We weren’t as vibrant as we were against Morecambe - we didn’t reach those heights,” Heath said. “But that’s to be expected. We made a couple of changes here and there but it was a good run out. Scott Brown didn’t feature on Tuesday and his chances of securing a deal appear to have gone. Fellow triallist Jame Jackson has left the club, with Heath saying he felt it “wasn’t the right time” to offer the striker a contract. Jordan Sinnott, Danny Hone and Josh Macdonald will all miss training on Thursday due to injuries. Sinnott (ankle) and Macdonald (dead leg) picked up injuries at Matlock, while Hone is recovering from an ankle injury sustained against Morecambe.